The audio of the so-called “Death Tape” (FBI No. 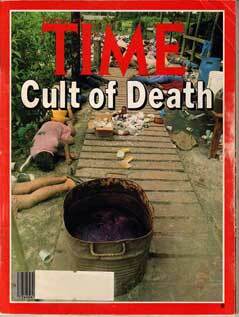 Q042) which was made in Jonestown on 18 November 1978 is available in digital form as an MP3 on this site (Pt. 1, Pt. 2) and through www.archive.org. Other Q 042 videos (oftentimes accompanied with images of the Temple in life and death) are compiled here. The following links take you to three different but fairly complete transcripts of this tape. A fourth link provides a summary of the contents of the tape, and a comparison with the FBI’s summary of the same tape. Differences among the transcripts are minimal. Transcript by Fielding McGehee, III, click here. Transcript by Federal Bureau of Investigation, click here. Transcript by Mary M. Maaga, click here. A French language translation by Jean-Luc Bailleul appears here. A Spanish language translation by Luis Ángel González Rocha appears here. Summary of the tape contents, click here. Additional transcripts of the death tape appeared in several books written soon after the deaths in Jonestown. None claimed to be complete, although they are all substantive. The works include: Mark Lane, The Strongest Poison (New York: Hawthorn, 1982), pp. 199-206. Jonathan Z. Smith, Imagining Religion: From Babylon to Jonestown (Chicago: University of Chicago Press, 1982), pp. 126-134. Stephen Rose, Jesus and Jim Jones: Behind Jonestown (New York: The Pilgrim Press, 1979), pp. 214-227. Links to these excerpts appear below. Transcript by Mark Lane, click here. Transcript by Jonathan Z. Smith, click here. Transcript by Stephen Rose, click here. This site also includes other articles which address different aspects of the death tape. For Fielding M. McGehee III’s commentary on the authenticity of the tape and on Jim Jones’ apparent references to U.S. Embassy official Richard Dwyer, click here. For Josef Dieckman’s discussion of the music on the death tape, click here. For Kyle Ray’s discussion of the music on the death tape, click here. For Amanda Veazey’s discussion of “ghost audio” on the death tape, click here. For Michael Bellefountaine’s discussion of Christine Miller’s independence, click here. For Michael Bellefountaine’s analysis of Christine Miller’s expression of opposition to death on the final day, click here. For Timothy Lisagor’s anlysis of the rhetorical struggle between Jim Jones and Christine Miller, click here. For Howard Motyl’s analysis of an alternative understanding of a sentence in the ‘death tape,’ click here. For Jason Schwechter’s discovery of references to Guyanese defense force, click here. Editorial note: Questions have been raised about the authenticity of this tape, due to the fact that a number of edits are audible. Moreover, the suspicion might arise that the tape was “constructed” out of the least objectionable sound bites of the day. Given the fact that other tapes generated by Peoples Temple also contain numerous edits, however; and given the fact that the tape refers to events quite specific to 18 November 1978, it seems likely that the tape is genuine in the sense that it was recorded on 18 November 1978. Last modified on March 19th, 2019.